Sometimes called stacks or garden totems, you can combine recycled bowls, vases and plates to form a vertical planter for succulents or mosses to make a stunning accent or even a bird bath. How many times have you picked up a beautiful vase or set of dishes in a thrift store or flea market, only to reluctantly put them down and leave them behind because you can’t think of a use for them? Going back later on, you might find them gone, scooped up by another crafter. Here’s a unique and fun way to combine all the treasures you find in junque stores, garage sales and yard sales, and repurpose your finds in whimsical garden art. This is rustic salvage at its finest. 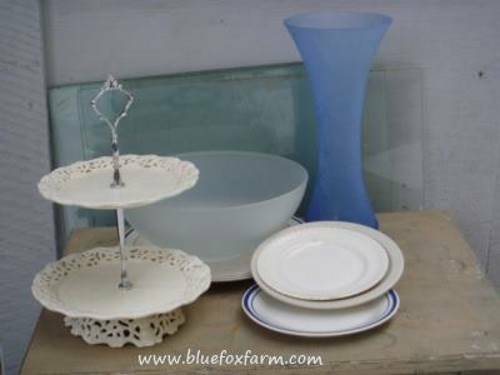 Collect your thrift store finds such as china bowls, dishes and other pottery items; Combine them to see which ones go together, and select several pieces that go well together and in the right colours for your garden. Using a colour wheel will give you ideas of which colours should blend well together or contrast. A simple monochromatic scheme works well too – a strict white or off white palette will be stunning in a moon garden, or planted around with herbs in a knot garden. Cut glass or leaded crystal can give you an eye catching focal point as it glitters in the sun. E6000 is a craft glue that is used for many outdoor crafts, and will bond pretty much anything. This glue comes highly recommended by many crafters, so it would be worth a try. I've used tub and tile caulking, a latex or acrylic product that can be either clear or white when it dries - the clear is my favorite, and make sure it's for exterior use if your garden totem will be kept outside all year. I like this product as it is slightly rubbery, so the piece has some flexibility once it's cured. Weldbond is a glue product that claims to 'bond almost anything' - and they're not lying! I've used this glue for lots of crafts, and the only thing I would have to complain about is that the small bottle doesn't hold enough! Ideally, it will remain flexible, even when it's cold out. As I've mentioned above, Weldbond 8-50420 Universal Adhesive, 14.2 fl. oz. is another favorite - you can buy this in smaller bottles, like with this link, or in gallon size - that's for the serious crafter! All of these types of adhesives will dry out if they aren't kept in an airtight bottle, so make sure you put the cap back on, and keep them above freezing to prevent them from separating. Some of these kinds of glue give off vapours while drying, so work in a well ventilated area, and as always, use common sense and a be safety conscious. 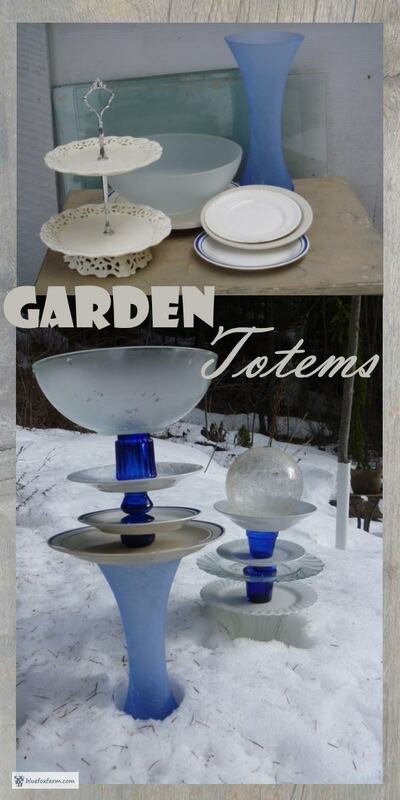 Water in the dishes of your garden totem may freeze in the winter and break or crack, so drain each one, or lay the totem down on its side for the colder months. Indoor storage is another option, or put your totem on a covered porch and fill the dishes with glass balls, pine cones or Christmas ornaments for a seasonal display. 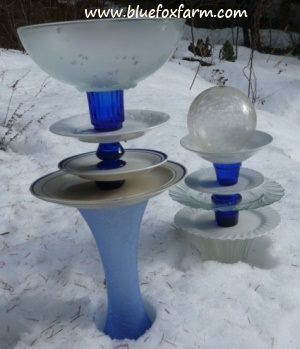 Another great way to use old dishes in your garden in the same vein is to make mushrooms - a fluted vase with an upside down cut glass bowl glued to it - make solar powered lights by including a small light inside.